Camber Security Ltd was established in Sept 2008 and provides a range of manned and technical security services to a diverse number of clients across numerous sectors and industries. Based in Coulsdon and Essex, we are one of London's foremost security companies and offer a diverse range of security services throughout the UK. We provide both manned and technical services, including security guarding, alarm installations, access control and CCTV for both domestic and corporate purposes. Should you be looking for more information, advice or a quotation, please don't hesitate to get in touch with us today. 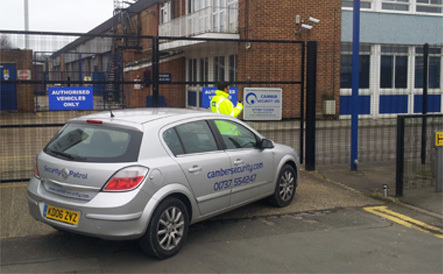 Camber Security Ltd took over management responsibility for all security issues (Guarding, CCTV and Access Control systems) at Wimbledon Film and Television StudioÃ¢ÂÂs in late 2012. They immediately produced an extremely detailed Ã¢ÂÂSecurity Action planÃ¢ÂÂ so as to improve the overall security of our premises, staff and other assets as well as improving our operational efficiency. Camber Security management team have become an integral part of the studioÃ¢ÂÂs management team to insure implementation of the Ã¢ÂÂSecurity Action PlanÃ¢ÂÂ across the whole complex. Camber Security LtdÃ¢ÂÂs approach and style is refreshing by the way in which they engaged with Wimbledon Studio management and staff across all aspects of the studio complex and not just regarding security related issues. Their senior management team and security officers demonstrate a level of professionalism which is second to none and has prompted many favourable comments from our clients. Camber Security are not just another security guarding company, they are pro-active in their approach to security and believe in working with their client in providing an all round professional customer focussed, security guarding and consultancy service. I would highly recommend Camber Security Ltd to any potential clients. Wimbledon Film & Television Studio's.